During the second half year of 2014, I went to Frankfurt University for a one-semester exchange program, which provided me with not only a broader horizon but also a memorable experience. The first thing that caught my attention in Frankfurt is its airport. We all know that Frankfurt Airport is one of the most famous in the world with tens of thousands of travelers passing by every day. However, the airport was not so large as I had expected it to be. On the contrary, it was small but with sufficient places for all the passengers to move efficiently. I think it is because of the well-developed design of each section, making it possible to satisfy the need of all the passengers. Another thing that I appreciated was definitely the university, especially the lectures there. I took the exams for six lectures. Among them I thought Derivatives 1 was the most interesting one. The professor presented us with not only the basic knowledge on options and futures contracts, but also the sophisticated parts about how to price the derivatives first with the replication portfolio and then with the binomial models step by step. And of course, we learned something about the Black-Sholes model and an intuitive way of deduction.We started with the basic stock derivatives, and we also refer to the market of interest rate and other underlying assets.By listening to the lecture, I thought that I started to understand the basic idea in financial engineering and it made me want to further my study in the field of finance. One of the special courses in Frankfurt University is called seminar. I took one of the seminars out of curiosity and it turned out to be fascinating.The seminar was named “Risk Management in Insurance Companies”. The instructor for the seminar was Mr. Wilson, the CRO of Allianz Group. Even though he was busy with the work in the insurance company, he still made it to the university and gave us a valuable lecture on how he managed the exposed risks in the multinational insurance company and what were the key points we should paid attention to when analyzing the topics. After that, we grouped into 10 teams and each focused on a different topic. Our topic was “Risk management in times of demographic changes”. We picked this topic becausemany countries in the world today face aging problems, a global structural trend leading to dramatic social and economic consequences. The society is increasingly aging with the high life expectancy and the lower birth rate. To begin with, we are interested in how the life expectancy and birth rate has changed in both Germany and China in the last half centuries, which demographic changes they have in common and how it could look in the future. With the rapid demographic changes, the topic of longevity risk is frequently mentioned in both academic and insurance industry. Individuals become aware of the potential threats of outliving their resources. Insurance industry also starts to recognize the effect, but if not managed carefully, the undiversified part may lead to more detrimental result. For the pension systems, the situation will not be optimistic because they cannot make a use of internal hedging for longevity risk, and the traditional approach will be turning outside to insurance companies for help. As for insurance companies, especially the ones run business in annuities products, it is difficult for them dealing with the increasing aging population because of the unexpected payment of annuity priced by the preset mortality rate. It can even lead to the insufficiency of reserves for insurers and the potential threats of insolvency. With the analyses of demographic changes from my teammates, it can be seen from many aspects that the demographic changes in both Germany and China bring not only opportunities but also challenges to life insurance industry. The increase of life expectancy may arouse the demand for annuity insurance due to policyholders’ afraid of losing coverage from government pension systems after retirement. However, we should not ignore that the extended life spans also have negative impact on private insurance companies and pension systems that manage annuities. In fact, the research on Chinese insurance industry shows evidence that many life insurance companies in China do not take all the impacts of mortality improvement into account. Even if some may be aware of the potential risks, they can hardly precisely forecast the mortality improvement or make adjustment due to many constraints. A specific characteristic which we should consider is that the longevity risk is systemic risk which cannot be eliminated by diversified portfolio. That is to say, insurers should ask for a risk premium for extra longevity risk to bear, which encourage a wide range of researches on refining mortality models, focusing on precisely pricing the undiversified risk. However, though the mortality models can accurately forecast mortality improvement, the tough competition among insurers will make it too costly and infeasible. As a result, I follow the work of my teammates and had a deeper analysis on alternative approaches to manage the longevity risk and compared their feasibility under the contexts of Germany and China. Natural hedge is regarded as an internal approach for life insurance companies to protect themselves from being exposed heavily on longevity risk. The basic mechanisms go in this way: the insurance companies underwriting both annuities and life insurance to the same policyholders can perfectly offset longevity risk and mortality risk from the two products and stabilize the aggregate liability cash flow. Cox and Lin (2004) make a further explanation that annuity is affected by longevity risk so the mortality improvement tends to aggravate the burden of insurers. On the other hand, the life insurance will benefit from increase of life expectancy because the expected payment for insurers will be less. We can think of the strategy as a life annuity, paying a unit benefit as long as the insured is alive, and a death benefit equal to the market value of one unit perpetuity upon the death of the policyholder. Reinsurance is an efficient transaction to protect the primary insurer from those potential losses. Same as coping with other risks, insurance companies can transfer the longevity risk to reinsurers, such as Swiss Re and Munich Reinsurance according to some special treaties negotiated by both parties. However, the capability of reinsurers is limited, so it will be costly or even impossible for reinsurance companies to bear all the mortality improvement for the insurers. One of the more reasonable ways could be that both sides sign an excess of loss agreement in which the insurers transfer the risk to the counterparty when the payment of annuities surpass a predetermined level. An alternative approach is to determine an upper bound for policyholders’ age, so if they survive and outlive a certain age, the annuities afterward will be paid by the reinsurers. There is also another way that when the insurers face the shortage of reserve comparing with unpredictable excessive annuity payments, reinsurers will provide the extra payment to cover the risk for insurers. Another possible solution could be transferring the risk to capital market. 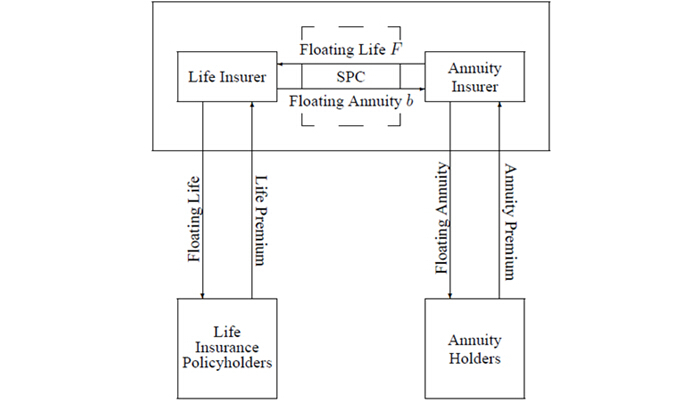 However, the fact is that annuities provider can hardly find an asset whose cash payment match perfectly with the anticipated pattern of payouts on the liabilities they face, Blake and Burrows (2001) propose that the government can help insurer better cope with the risk by issuing survivor bonds. From their description, the future coupon payments of survivor bonds can be designed to match the proportion of a group of people at the retirement age that is still alive on the future coupon payment dates. So if the annuity insurers buy the survivor bonds, the outflow of cash on annuities plus the inflow of coupon payments from the bonds will add up to a fixed net cash flow each year. Dowd (2003) briefly explains the idea of survivor swap but only suggest swap within annuity insurers. Based on the weakness and characteristics of natural hedging, a more feasible proposal is provided by Cox & Lin (2004), in which they propose to swap longevity and mortality risks between annuity insurers and life insurers. To some degrees, it overcomes the difficulty and complexity of changing business composition inside the insurance companies. However, another potential threat arisen is the counterparty risk, that is, the risk that one side of the insurer may default. On the following research, survival swap is explained as an agreement to exchange cash flow in the future time based on the outcome of at least one survivor index. A special extension, vanilla survivor swap (VSS), is also discussed in the paper. VSS includes one fixed leg which involves preset payment declining over time and one floating leg which depends on the realized value of the survivor index at time. As analyzed in the parts above, the demographic changes in Germany and China have not only similarity but also distinguished features due to the economic and non-economic factors. Based on the two countries’ characteristics, we assume that the appropriate solutions to longevity risk will be different. Germany has a better-established capital market and longer practical experiences in life insurance and annuity, which provides more favorable conditions for securitization. China, as a developing country, has a rapid improvement on capital market, but the investigation on longevity risk from both researchers and insurers are not sufficient. So is the awareness and education for using survivor derivatives. Based on the life insurance market research in 2012 , life insurance and pension/annuity have almost equal market shares in Germany, so the application of natural hedging and securitization would be more feasible than that in China, where the life insurance products account for 95.5% of the market . But it also shows that longevity risk will be a more serious problem for annuity insurers in Germany with a higher market share. For China, it is the government pension system that faces the severest problem with no efficient ways applied to manage the mortality improvement trend but to rise the retirement age. Through analyzing the conditions above, it can be roughly concluded that Germany has more advantages in dealing with longevity risk for both public and private sectors through capital market. As for China, the most critical problems will be on the development of capital market and for the government’s pension system to cover the increasing requirement for pension. When market failure is appearing, it will be more feasible for Chinese government to help bringing up the survivor bonds to the market for both pension system and life insurance industry. 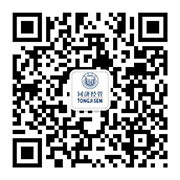 But with the reform of economy policy in China, more dependence on capital market itself should be expected in future. The suggestions above are only generated from the relatively different situations and strengths between the two counties. It will still need further researches of deeper comparisons and analyses to determine the proper solutions for longevity risk. Apart from study I also travelled to many other countries in Europe, such as France, Switzerland and Czech Republic. Among them I loved Switzerland the most, because it not only had the most elegant and tidy avenue with world-famous financial institutions but also the most beautiful landscape, especially many small villages in the mountainous area. During the Christmas, the decorations were so beautiful shining on the evening that you would wonder whether it was in a fiery tale. Even though I had only been on the exchange program for five months, I could clearly notice the differences in cultures, economy and educations between Europe and China.I am really grateful for this precious opportunity to study in Frankfurt University and to enjoy my college life in a totally different environment. To be honest, it is the exchange experience that makes me strengthen my idea of achieving further study in Finance, and more importantly, contributing to the financial development of China in the future.